Lilian Ndhlovu (left), owner of Mirian and Lilian Transport, with some of her employees. MTO Forestry’s contractor incubation programme strengthens contractor businesses in MTO’s forestry supply chain, adding value upstream and downstream and supporting local businesses. 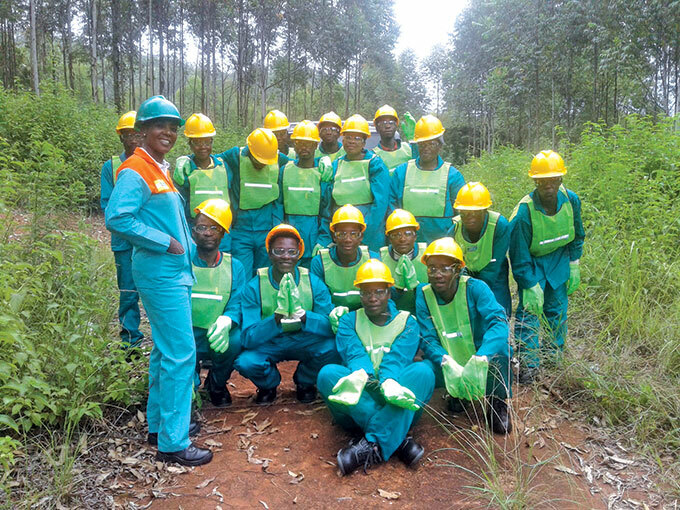 Lilian Ndhlovu’s forestry journey began working alongside her husband who was providing silviculture, harvesting and transport services to MTO Forestry in the Mpumalanga region. This is where she developed a love for forestry and decided she wanted to pursue it as a career. She went on to register her own company and secured a short-term ‘trial’ contract for six months with MTO. This was subsequently extended due to her performance and her willingness to learn. She then got an opportunity to participate in MTO’s incubation program designed to help develop emerging contractors. The programme aims to teach participants the peripheral business skills that will help them expand and improve their businesses. Lilian said that the program gave her an opportunity to improve her all-round business skills and also gave her a chance to interact with fellow contractors. This made her realise the importance of learning from others instead of just competing against them. Today Mirian and Lilian Transport employs 25 people and provides silviculture services for MTO in the Bergvliet, White River area. “Our contractors have always been loyal to MTO, especially through some of our most testing times,” said MTO Group CEO Lawrence Polkinghorne. “During the fires across our Cape region, all of the programme’s contractors put their teams and their own lives on the line to save the plantations that they build their livelihoods on.